Alanga is for those looking for a modern, well-appointed yet cosy hotel by the Baltic Sea. Located in the centre of Palanga but away from the noise on a peaceful back street, Alanga offers a comfortable stay, attentive service and a short walking distance to the central Basanavicius Street, Palanga beach and the pier. On quiet nights you can even hear the soothing sound of the Baltic Sea from the hotel room. 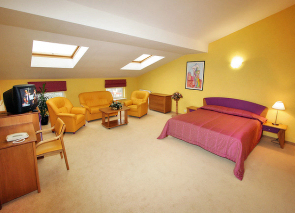 They have 47 comfortably furnished rooms (including 28 doubles, 14 luxury doubles and 5 apartments). 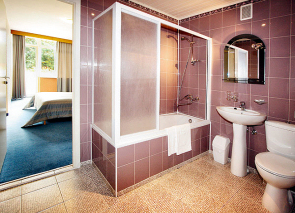 Every room has a shower or bathroom, satellite television and telephone and mini bars. If you prefer to do your own cooking ask for a room with a small kitchen. 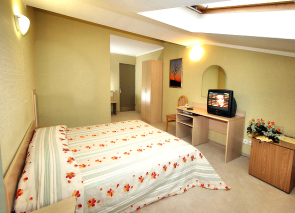 Hotel services include room service, meeting/banquet facilities, business centre, babysitting/child services, laundry, ironing, dry cleaning and breakfast in the room. Other hotel services include car rental, pick-up from the airport or railway station, plane and ferry ticket booking, organising excursions, picnics and horse riding on the beach. You can also rent their bicycles and beach amenities. 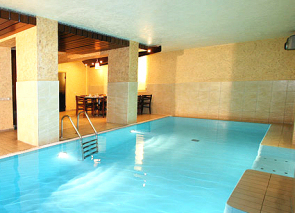 The hotel offers several sauna rooms and an indoor swimming pool with underwater streams. To have more quality leisure time you can use other hotel facilities, including a fitness centre, solarium, massage parlour, billiards and pool tables or use their wireless Internet service. There is also a special indoor playroom for children. A cosy restaurant offers a variety of European cuisine dishes and beverages in a welcoming atmosphere. If you wish to read other people’s reviews who stayed at the Alanga Hotel or check out available booking dates. Click on the link below.